To commemorate his extensive scholarly work on religions in Europe and his reflections on European society, the French philosopher Rémi Brague was the third scholar to be awarded the All European Academies Madame de Staël Prize for Cultural Values. 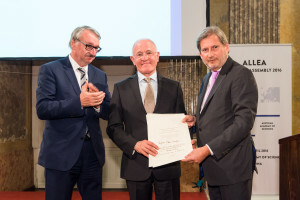 Rémi Brague received the prize from European Commissioner Johannes Hahn at the award ceremony during the 2016 ALLEA General Assembly at the Austrian Academy of Sciences. The a prize was initiated by ALLEA, the European Federation of Academies of Sciences and Humanities with the friendly support by Stiftung Mercator. 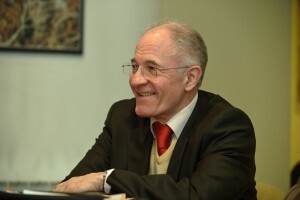 Rémi Brague, born in Paris in 1947, is professor emeritus of Arabic and medieval philosophy at the Sorbonne in Paris and holds the Romano Guardini chair of philosophy (emeritus) at the Ludwig Maximilian University in Munich. Professor Brague’s work provides an invaluable wealth of analysis on the interplay between Judaism, Christianity and Islam as they progressed through history. His best-known works are Europe, la voie romaine (1992) (E: Eccentric Culture: A Theory of Western Civilization (2009), Au moyen du Moyen Age: Philosophies médiévales en chrétienté, judaïsme et islam (2006) (E: Legend of the Middle Ages: Philosophical Explorations of Medieval Christianity, Judaism, and Islam (2009) and La Loi de Dieu. Histoire philosophique d’une alliance (2005) (E: Law of God: The Philosophical History of an Idea (2008) and Du Dieu des Chrétiens et d’un ou deux autres (2008) (E: On the God of the Christians (and on one or two others) (2013). The All European Academies Madame de Staël Prize for Cultural Values is co-sponsored by Stiftung Mercator. ALLEA established the prize to pay tribute to the boundless intellectual and cultural diversity and richness of Europe, and to highlight how outstanding scholarly work, particularly in the fields of the humanities and social sciences, contributes to the understanding of Europe as a cultural and intellectual entity. The first laureate, Professor Luisa Passerini, received the prize from former European Commission President José Manuel Barroso in 2014 to honour her work on European cultural identity. In 2015, Professor Dame Helen Wallace was awarded the prize by EU Commissioner Carlos Moedas for her outstanding work on political studies and policy in Europe.